John Vianney was born in a village near Lyons, France shortly before the French Revolution. His parents, poor farmers, were devout Catholics and brought up their son to be the same. John received minimal schooling while working as a shepherd on his family farm, and he longed for more education. From an early age, he developed a desire to become a priest. At about the age of eighteen, he voiced the idea of a priestly vocation to his father, who immediately discouraged him. John was of great help on the farm, and his father could neither afford to lose him, nor to finance his education for the priesthood. Yet John did not give up on his dream. About two years later, John got permission to attend a lower seminary that had been established in a neighboring village by the Abbé Balley, a priest who was to play a major role in John’s formation. With John’s meager educational background, learning came very hard to him, and he struggled with his subjects, particularly Latin. During the summer, on a sixty-mile pilgrimage to the shrine of St. John Francis Regis, he sought God’s help in becoming a priest. While his studies became no easier, the deep discouragement that John had felt was lifted from him and his goal was reaffirmed. After years of hard work, John was finally ordained in 1815, and his first assignment was as the assistant pastor for his mentor, Abbé Balley. In this position, his reputation as a confessor began to grow and many sought him as a spiritual advisor. But in 1817, Abbé Balley passed away, and the following year, John was made curé (pastor) of his own small parish in the village of Ars-en-Dombes. Drawing people from the region and beyond, the priest would spend twelve to sixteen hours a day in the confessional rather than turn anyone away. The curé had an insight into the souls of his penitents, and on many occasions, he reminded them of sins that they had forgotten or how many years it had been since their last confession. A small shrine dedicated to St. Philomena was installed by Father John at his church soon after his arrival, which attracted many pilgrims. There, many miraculous cures took place. With his encouragement, a shelter and school for homeless girls was opened in Ars. There, too, many unusual occurrences would come about. For example, on more than one occasion, more than enough food to feed the girls was produced from an almost bare larder or the exact amount of money to pay an important bill would somehow find its way to the school. John Vianney, who was known as the Curé d’Ars, died on August 4, 1859. Even on his deathbed, he called penitents to him to finish hearing their confessions. 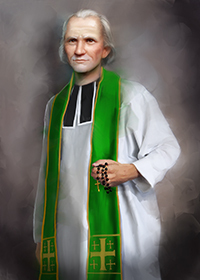 St. John Vianney was canonized in 1925 by Pope Pius XI. He is the patron saint of parish priests. John's message today: Earl Nightingale, a noted inspirational speaker, said that we become what we think about. John kept the vision of what he wanted firmly in his mind and prayed often that he would achieve his goal. After many disappointments, John experienced success. His formula was simple and one that is available to us today: dedicate yourself completely to your goal and try to minimize distractions. Do you become distracted from your goal? Have your tried concentrating on that goal in prayer? Anything is possible with God’s help.